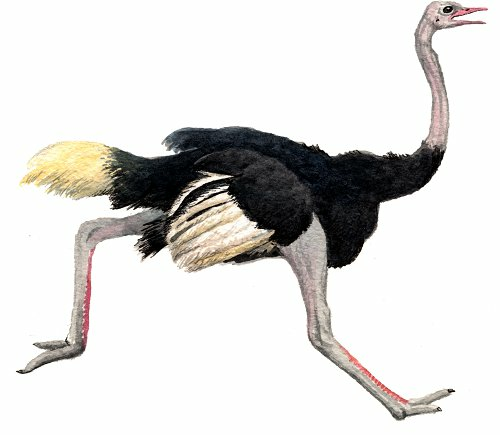 GigaDB Dataset - DOI 10.5524/101013 - Genomic data of the Ostrich (Struthio camelus australis). Genomic data of the Ostrich (Struthio camelus australis). The Southern Ostrich (Struthio camelus australis (Gurney, 1868)) is a sub-species of The Common Ostrich (Struthio camelus) and found in southern Africa, south of the Zambezi and Cunene rivers. It is a flightless bird native to Africa and the only living member of the genus, Struthio. The Ostrich is farmed throughout the world for its meat, feathers and leather. These data have been produced as part of the G10K and Avian Phylogenomics Project. DNA was collected from a female at the San Diego Zoo in California by Oliver Ryder, of an animal originally from Botswana, Africa (ISIS ID: 202443). We sequenced the 2.16Gb genome to a depth of approximately 85X with short reads from a series of libraries with various insert sizes (170bp, 500bp, 800bp, 2kb, 5kb, 10kb and 20kb). The assembled scaffolds of high quality sequences total 1.23Gb, with the contig and scaffold N50 values of 29kb and 3.5Mb respectively. We identified 16,178 protein-coding genes with a mean length of 19.5kb. Update - 13-AUG-2014 - A new assembly making use of the optical mapping data has been release, this improves the assembled scaffolds N50 to 17.7 Mb, the protein count is unchanged. Displaying 1-9 of 9 File(s).